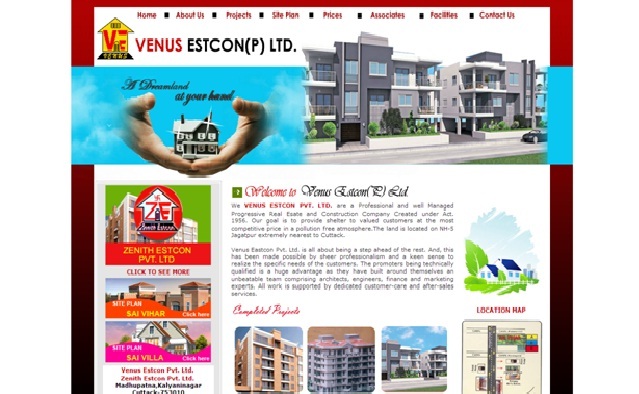 Venus Estcon is a professional real estate company located at the old city Cuttack, Odisha. This company is dedicated to provide best customer and sales services. This company provides readymade lands, simplex, duplex, apartments to their esteemed customers in the various locations of the State. This project is located at Jagatpur, Near NH 5, Cuttack, and Odisha. This project is a distance of 6 km from Link Road, 100 meters from Bus Stop, 5 km from SCB Medical College, and 5 km from Cuttack Railway Station. This project provides all the facilities such as Temple, Market complex, School, ATM around the project area. This project is situated at Jagatput, Cuttack, Odisha. This project is a distance of 13 kms from Link Road, Cuttack, 8 km from SCB Medical College, 8 km from Railway Station and 9 km from Baramunda Bus Stand, Cuttack. This project is surrounded with Market complex, Temple, School, Govt. Offices, Post Office, Petrol Pump, and ATM.